Last week I was down in Maryland visiting my sisters and seeing lots of family at a wedding. One morning, my mom and I went to consult with one of my sisters about various plants that had been planted by the previous tenants outside her apartment. 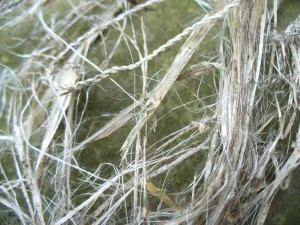 In one spot we found some very intriguing dead and naturally weather-retted bast fiber from the previous year’s growth. Unfortunately I did not bring my camera so I don’t have a photo of it in situ. We don’t know what the plant is, but my sister will keep an eye on it as it develops so we can identify it. 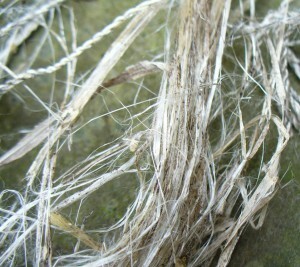 Here are some photos of the fiber and cordage. My method was this: I twisted a bundle of fibers enough to get a kink at the center, then bent the bundle in half. I used my teeth to hold the middle, and twisted both sides at the same time, between my thumbs and index fingers, rolling to the left. 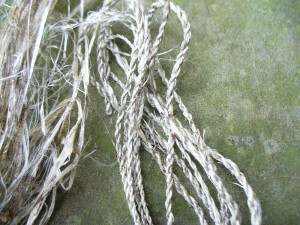 (That is, I twisted the left strand with my left hand, and the right strand with my right). Then I wrapped the two strands around each other twisting to the right. To add a new piece, I repeated the starting procedure, but inserted the new bent middle section into the “v” where the two strands separate. 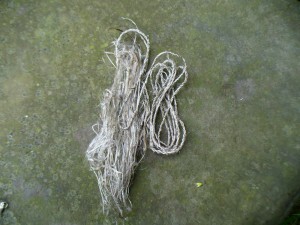 I tried to keep the two sides slightly uneven so that the splices would be staggered. I think it has a very pretty silvery quality. I would be happy to use this plant again, once I find out what it is. I have pictures! Sadly, despite typing many applicable strings into Google, I have not been able to identify the plant yet. I have had fun typing things like “pink umbell tubular lanceolate”, though. I’m sort of hoping it will end up being part of the Pimpinella family, just because “Pimpinella” is so fun to say. I don’t seem to be able to post pictures in this reply, so stand by for email.